About a week ago I woke up to find that many of the trees around my house had grown pink fluffy bits. I think they look especially pretty. 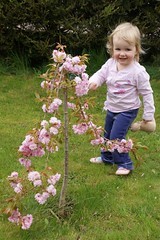 Mummy says this one in our garden is my very own pink fluffy tree. It is so beautiful.